This unique analysis of the rise of the juvenile justice system from the nineteenth to twentieth centuries uses one of the harshest states—California—as a case study for examining racism in the treatment of incarcerated young people of color. Using rich new untapped archives, States of Delinquency is the first book to explore the experiences of young Mexican Americans, African Americans, and ethnic Euro-Americans in California correctional facilities including Whittier State School for Boys and the Preston School of Industry. Miroslava Chávez-García examines the ideologies and practices used by state institutions as they began to replace families and communities in punishing youth, and explores the application of science and pseudo-scientific research in the disproportionate classification of youths of color as degenerate. She also shows how these boys and girls, and their families, resisted increasingly harsh treatment and various kinds of abuse, including sterilization. Miroslava Chávez-García is Associate Professor of Chicano/a Studies at the University of California, Davis. She is the author of Negotiating Conquest: Gender and Power in California, 1770s to 1880s. 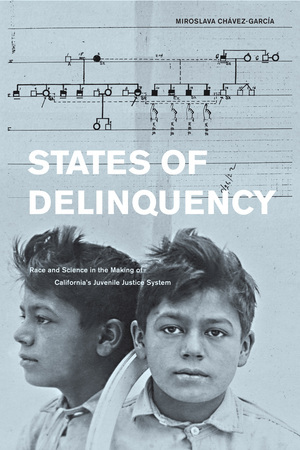 “Impressively researched and passionately argued, States of Delinquency shows how racial prejudice and bogus social science reshaped early twentieth century juvenile corrections in California. Chavez-Garcia recreates both the everyday world of reform schools and the lives of delinquent youth, especially minorities, who were unfortunate enough to be confined there (or, worse, reassigned to special hospitals for sterilization). This book is an innovative, disquieting, and vividly detailed contribution to historical scholarship on the theory and practice of American juvenile justice.”—Steven Schlossman, author of Transforming Juvenile Justice. “A fascinating and compelling study that reconstructs the forgotten lives of California's marginalized and criminalized youth. States of Delinquency illuminates the unsettling history of the juvenile justice system and demonstrates its relevance to the disproportionate incarceration of racial and ethnic minorities today.”—Alexandra Minna Stern, author of Eugenic Nation: Faults and Frontiers of Better Breeding in Modern America. 6. The Legacy of Benny Moreno and Edward Leiva: “Defective Delinquents” or Tragic Heroes?